OMAHA, Nebraska, June 27, 2011 (ENS) – Nuclear Regulatory Commission chief Gregory Jasko is today inspecting Fort Calhoun Nuclear Station in Nebraska, where a protective berm broke Sunday, allowing Missouri River flood waters to surround containment buildings. The nuclear reactor was not affected by the flood waters said company and government officials. The reactor is housed in a watertight containment building, and is in a normal and safe “cold shutdown” condition, covered by more than 23 feet of purified reactor coolant water. 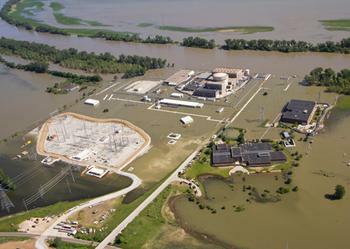 Located on the Missouri River about 19 miles north of Omaha, Fort Calhoun was shut down for a refueling outage on April 7 and operators have decided not to restart the plant until flood waters recede. Water from the river normally is used to cool the plant’s nuclear fuel. The inflatable berm that had been providing extra flood protection for the Fort Calhoun nuclear power plant was punctured and deflated “due to onsite activities” early Sunday morning, OPPD said in a statement. The collapse of the berm allowed floodwaters to surround the main electrical transformers. Operators transferred power from offsite sources to the emergency diesel generators as a precautionary measure due to water leakage around the concrete berm surrounding the main transformers. As a precaution, per plant procedure, the operators started the diesel generators and temporarily disconnected from off-site power. Plant operators later reconnected to off-site power once all safety checks had been completed. NRC inspectors were onsite at the time and responded to the event, said NRC spokesman Victor Dricks. “They have verified that reactor shutdown cooling and spent fuel pool cooling remain unaffected,” he said. NRC augmented its resident inspection staff on June 6, to provide around the clock coverage of site activities. In addition to the two resident inspectors, three more inspectors and a branch chief now are there. There is now two feet of water in many areas onsite. 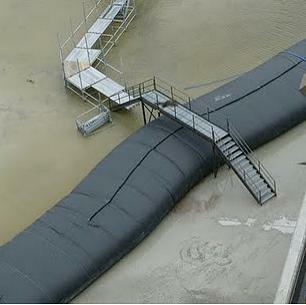 Flood gates and additional sandbagging around the plant were put in place last week. OPPD erected the water-filled berms, called AquaDams, around the vital areas including the containment and auxiliary buildings. The berms are eight feet tall and 16 feet wide at the base, and are intended to provided protection for up to six feet of water and also to protect an additional emergency diesel generator for supplying AC electrical power, water pumps, firefighting equipment and sandbagging supplies. An AquaDam vendor was onsite Sunday working to repair the puncture, says OPPD. In addition, an earthern berm protects the electrical switchyard and a concrete barrier has been built around electrical transformers to protect them. Satellite phones have been distributed to key workers and extra food and water has been stockpiled. Existing diesel fuel tanks have been topped off and two additional fuel tanks have been brought onsite. If there is a complete loss of power on the site, temporary pumps that run on gasoline can circulate cooling water through the spent fuel pool and reactor core. “Plant capabilities remain undiminished, despite the rising water,” said Dricks. Flight restrictions over the plant were set up by the Federal Aviation Administration as a result of Missouri river flooding. There was a fire in an electrical switchgear room at Fort Calhoun on the morning of June 7, and the plant temporarily lost power to a pump that cools the spent-fuel pool. The fire-suppression system in that switchgear room operated as designed, extinguishing the fire quickly. Due to this situation, on June 7 Fort Calhoun operators declared an Alert, the second-least-serious of four emergency classifications established by the Nuclear Regulatory Commission. Four hours later, the operators declared they had taken all appropriate measures to safely return to the previously declared Unusual Event emergency classification. Today, Unusual Event declarations, the lowest of four levels of emergency notification, remain in effect at Fort Calhoun and also at Cooper Nuclear Station, located in Brownville, Nebraska. At Cooper, Nebraska Public Power District officials have installed barriers to protect buildings and structures from flooding. A berm has been placed around the plant’s electrical switchyard for additional protection. The licensee does not expect floodwaters to impact vital plant equipment.